When my work PC came off lease I took the necessary steps to back up my documents, IE favorites, etc. so I could add them on the new machine. 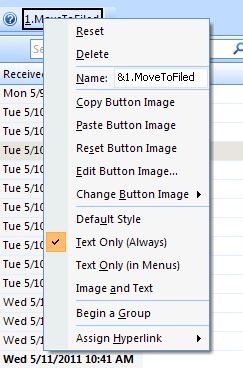 After getting the new machine (and turning in the old one), it didn’t take me long to realize I had forgotten to copy something I use A LOT – Outlook macros. Unfortunately, I didn’t make notes when I set them up several years ago, so I had to start from scratch. 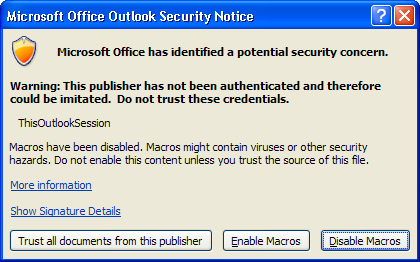 There were plenty of examples on the web, but each assumed the target folder was located under the Inbox folder. My target folders were located on the same level as the Inbox. I finally got it working and decided to document the process for future reference. While my email inbox never really gets to ‘zero,’ I am able to keep it pretty lean – depending on how diligent I am in following the GTD system. To create folders, right-click where you want to the folders to be created and select “New Folder” from the pop-up menu. I created my folders under the main Mailbox home folder. If you want to have your folders sort to the top of the list, start the folder name with a symbol such as ‘@’. 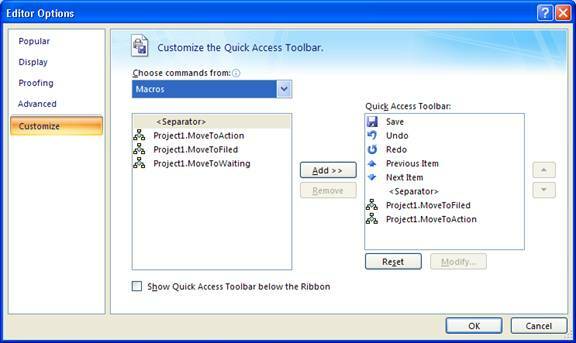 In Outlook (2007), click on the Tools | Macro menu item and select Visual Basic Editor (or use the Alt+F11 shortcut). 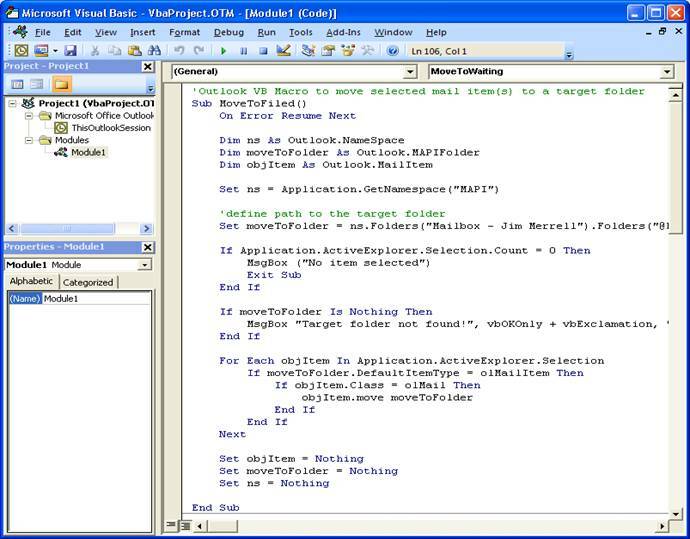 Copy/paste the following VB Macro into the script editor. 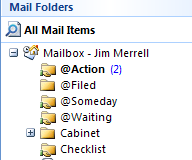 Make sure to change the name of the folders to match your email setting. MsgBox "Target folder not found! 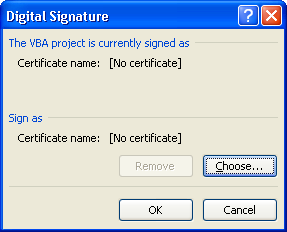 ", vbOKOnly + vbExclamation, "Move Macro Error"
To test the macros, click Run on the menu, the green ‘play’ button, or press F5 (Run Macro) in the VB Editor window. 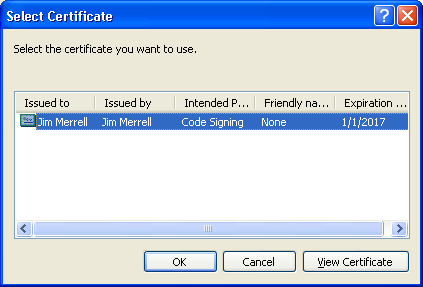 If no errors are displayed, verify that the selected email(s) has moved to the desired target folder. 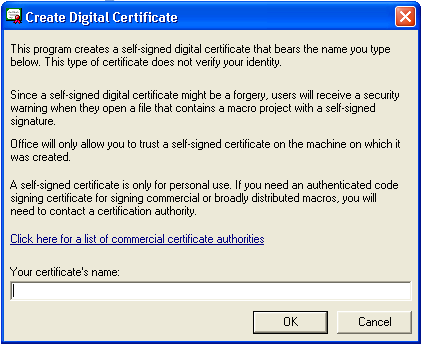 Update 5/25/2011: If nothing seems to happen when you run the macro (i.e., no error message and the email isn’t moving to the target folder), the security settings on the machine may be blocking the macros from running. See the following post for more information. 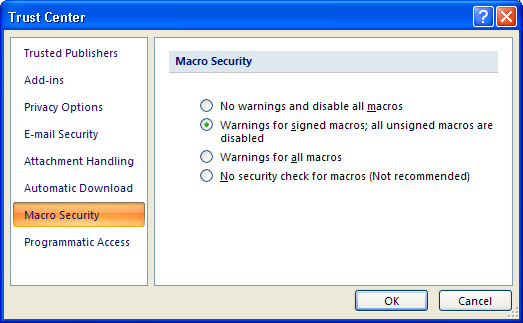 On the Commands tab of the Customize window, scroll down the Categories list and select Macros. You should see the macros (created in step 2 above) in the Commands section. 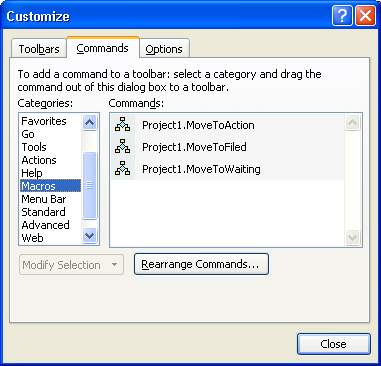 To add a macro to the toolbar, left-click and drag the macro command(s) to the toolbar and release in the desired location. Now you can run your macro by clicking on the toolbar item, or using the Alt+1, Alt+2, or Alt+3 shortcut.